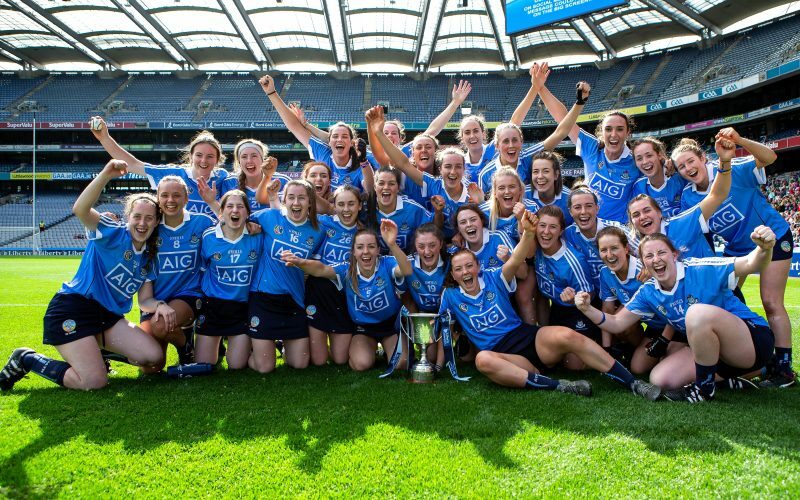 “We’ve come a long way since a ceilí in November” beamed Dublin captain Emer Keenan after her side bounced back from last years final defeat to Westmeath, to deliver the Liberty Insurance Premier Junior All-Ireland Camogie title in Croke Park this afternoon with a 1-11 to 0-6 win over Kerry. Shane Plowman’s charges came up against a youthful Kerry side in their first ever decider, with experience coming to the fore for Dublin. Full-forward Aoife Bugler top-scored for the capital outfit with 1-3 including a 15th minute goal which was the difference between the sides after a tencious opening quarter. Kerry looked nervous early on, with the vast majority of their side under 23, but the Kingdom came into this game as the contest progressed, and no doubt will make their return to Croke Park in the not too distant future. When one considers that the bulk of the Kerry players, including all of the starting 15 are from the one club (Clanmaurice), the significance of their achievement in reaching a final is even more special. Dublin struggled in front of the posts early on, and registered two wides inside three and a half minutes, both from Aoibhe Dillon placed balls. Dillon who was making her Croke Park debut for Dublin claimed the games opening score in the ninth minute from a free to settle her side. Kerry’s attacks were limited in the opening quarter, but when Patrice Diggin levelled with the first of her five points on the day, it gave the Kingdom great confidence. Dublin amassed their fifth wide, before a great team move which saw a trio of St. Oliver Plunkett’s/Eoghan Ruadh players come to the fore. It started when Caoimhe Ní Mhaolagáin won the ball deep in the heart of her own defence, before working the ball upfield for Laoise Quinn to find Aoife Bugler who rattled the Kerry net. Dublin immediately pressed for a second goal, but were met by resistance from the Kerry defence, with Michelle Costello impressive. Despite leaking a goal, Kingdom goalkeeper Aoife Fitzgerald also had a solid hour, and denied Aoife Dooley in the 19th minute, after Diggin added her second pointed free. Dublin pressed hard before the break scoring five unanswered pointss with Dillon (2), Bugler, Player of the match Caragh Dawson and Quinn on target, to ensure a 1-6 to 0-2 interval lead. Kerry were hungrier on the restart, but it was Dublin who pressed first with Aoife Walsh’s goal effort blocked, before Hannah O’Dea fired wide. Diggins claimed two pointed frees inside two minutes, one either side of a fine score from Sinéad Wylde for Dublin. Bugler and Laura Collins traded scores, with Collins effort Kerry’s first score from play. This left the score at 1-8 to 0-5 after 43 minutes, but Kerry could only manage one further point over the remainder of the hour. Kerry’s last score of the game, saw Diggin register her fifth point from a placed ball in the 55th minute, as Dublin closed out the game with three unanswered points, including one from skipper Keenan who was just 90 seconds off the bench to claim the final score. After the game Emer Keenan received the Kay Mills Cup from Camogie President Kathleen Woods welcoming ‘Kay Mills back to Dublin’ Mills was a legendary Dublin Camogie player who won 15 All-Ireland titles. Scorers for Dublin: Aoife Bugler 1-3 (2f); Aoibhe Dillon (3f) 0-3; Sinéad Wylde, Laoise Quinn (1f) 0-2 each; Caragh Dawson, Emer Keenan 0-1 each. Scorers for Kerry: Patrice Diggin (5f) 0-5; Laura Collins 0-1.